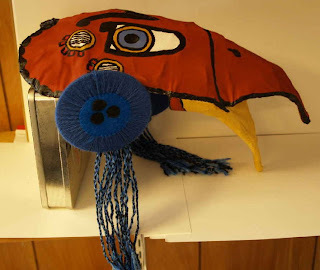 The last time you saw the bird mask, it still had to have all the symbols painted on it, and the disks made and attached. It is now done. I am selling it on Etsy, and starting another, of a different type of animal. 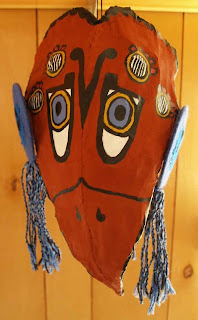 The purpose of the project wasn't to keep the mask - it was to use technique and skill to achieve the form imagined. I wanted to see the reoccurring images of these animal masks come out of my artworks and into the 'real world' as pieces of art. My Reading: The symbols I used on the outside of the mask read basically 'Protector of Life.' On the inside of the mask, they read 'Seeker of Lifepath.' This isn't of any specific religion or ethnic culture, but rather a mixture of symbolism, language and mythology from many cultures I have studied over the years. 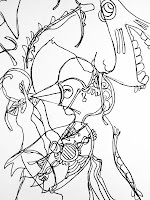 This is the kind of bird mask that shows up in my random-line drawings like in the samples seen below. 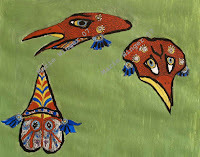 General Reading: I see this kind of bird spirit, and the use of the mask in the drawings, as both a messenger and a giver of knowledge. 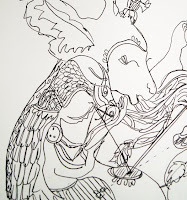 The image or form of the bird can also be a medium for seeking such knowledge, depending on how it appears in the drawing. Birds have superior vision, the capability to escape to other places and return quickly. Birds bring messages from the spirit world, or secret knowledge that otherwise would not be accessible to the person receiving it. I hope you have enjoyed seeing the process of this mask designed and made. A funny thing happened in our yard today... Alas, it was not a photographable event. It was over before I stopped laughing about it. DeeDee and Blaze (two of the Great Danes) were standing staring into their water dish, which is the auto-fill type. Every time they would dip their head, they would shoot back up and look at each other. As I got close enough to see - there was a LARGE FROG sitting in the dish that was guarding the waterdish from two very confused dogs! 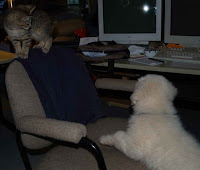 Every time they tried to get a drink he would splash and hop as if to say 'Go Away Dog - MINE!' 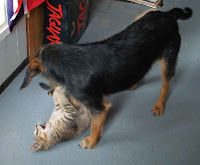 DeeDee eventually took her nose and pushed him hard to the other side (brave dog) and took a drink anyway. Here are some shots from our yard, which is still bustling with life. 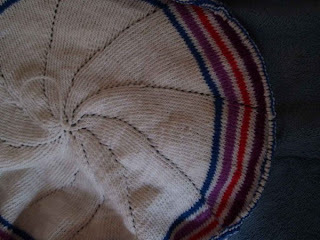 And a knitting update on the circular shawl. 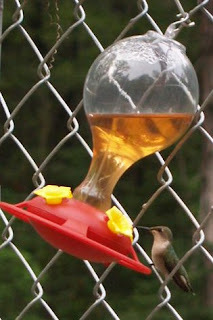 A hummingbird at our feeder. 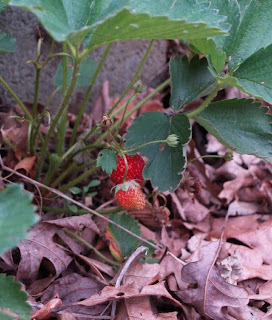 Our strawberry patch is producing ample quantities for waffles and milkshakes. Amazing, if you knew how big it is! 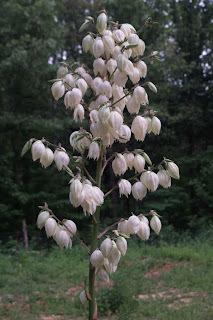 A pretty yucca plant out by the garden. 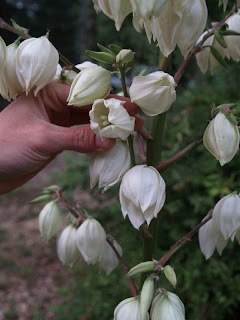 A close-up shot of the yucca flowers. The circular shawl is now 17 inches in diameter. Of course, the other 19 inches of diameter are going to take a lot more work to get than these past 17... gotta keep knitting. 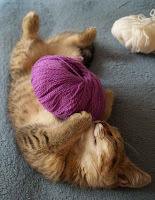 Early in the day I was knitting on the circular shawl, and caught these 'kitten love yarn' pictures. I told her she could have the purple one if I could keep using the blue one that was dancing around. Later in the evening, we find a very different looking Pogo outside. At least, different in the volume of nose she possesses. I fundt a wasspf & my nozsh hurtshes. 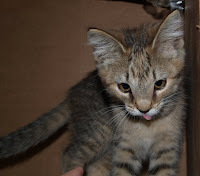 The tongue thing was because I caught her at the food bowl. She seems to be eating and drinking fine. 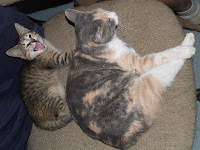 However, I could have sworn Mouse and Yeller (the outside boy cat) were laughing their paws off at her. Is it Friday already? weekly roundup. We're starting to sort through our inventory (new and old) from the trip and redo counts. 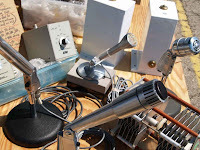 We bought a variety of cool antique electronics to Ebay as well as the toys we bought to keep. There are lots of switches, cables and connectors to restock on as well. Last night we made Chex Mix and ate too much of it. Also watched Apocalypto - bloody movie but it had a good plot. It was cool to hear the Mayan language (or an approximation of it) spoken. I did recognize a few words from when I was studying the heiroglyphics like 'balam' - 'jaguar.' On the shortwave radio I was able to get Deutsche Welle, a German radio station. However, I can only get it outside because of our metal roof. Listened to that while weeding the garden a few days ago. 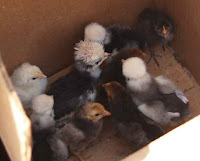 On Tuesday we went to the Huntingdon fleamarket and picked up these little peepers for Mark's mom. Chinese Topknot chicks and assorted friends. 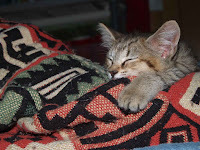 Pogo and Pixie are both growing fast - and when Puck and Mouse get sick and tired of them, they find each other to chew on. 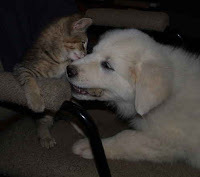 Pixie attempts to eat Pogo's feet - thinking that will give her an advantage. But the kitten is quicker than the polar bear puppy, and escapes. 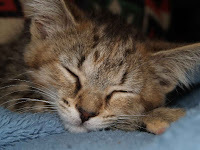 And our winner, Pogo the kitten, for finding the high road. 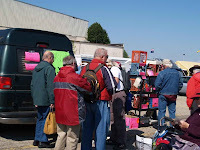 We were at the Dayton Hamvention Friday through Sunday. 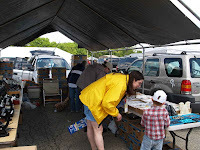 It was my first Hamvention - although Mark has been coming (and selling at the fleamarket) for years. 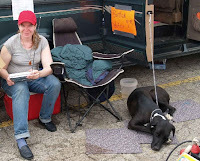 We brought Blaze along and she was a big hit among all the people who had left their dogs at home. We kept getting asked 'Is that a Great Dane?' (or greyhound, depending on if they had seen a Great Dane before). 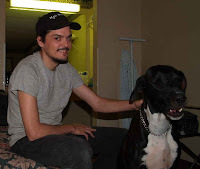 Mark and Blaze at the hotel. 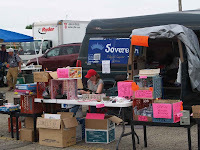 Our flea market was bright and well-marked, or so we were told! At one point, we got really busy! Mark catches me playing with the Sangean ATS-505P shortwave radio we bought. Other fleamarket scores: We haven't unpacked them yet, but Mark scored a few electronic hobby toys from 'the golden age.' We had them out on our table to see what other people thought, and they really got a lot of attention. 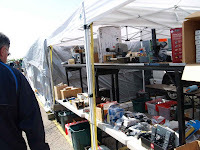 We didn't want to sell some of them though - including a miniature robotic arm and a 200 project electronic wiring kit. Mark found a full set of 'Dr. Dobb's Journal of Computer Calisthenics and Orthodontia' volumes and a complete metal train railroad kit as well. 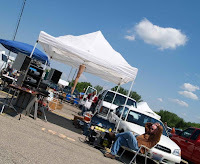 We told this man he could have this HEAVY power supply for $5.00 if he could pick it up... and we could photograph him doing it for the blog. He was a really good sport! This man showed us his 'keyboard experience,' a Blue Man Group contraption of strange design. We took some video as well, although that takes a while to convert and pull off, but it's on the way! We're Off - be back Sunday night! Mouse claims this never happened.. but we have photographic evidence. 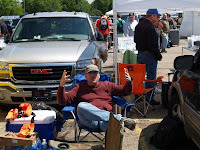 We're off to the Hamvention in Dayton, Ohio! Mark's parents will check in on the animals while we're gone. 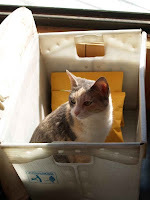 We're busy getting ready for Hamvention - and the cat crew is trying to find ways to get in on the act. 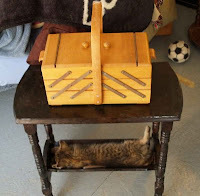 No cats were packed during the course of this blog post. 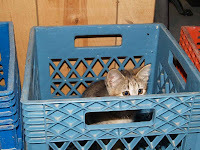 Pogo tries a milk crate on for size. Remember when we posted the picture of Pogo getting her bath? We finally were able to pull video from the camera (with a lot of work on Mark's part and some Linux Kino magic). So, here goes - our first attempt at a Youtube video! And for those of you who can't view video, more Pogo pictures from the weekend. I have the mask nearly complete, just a bit more work on the disks that go on the side and then it will be ready for more pictures. An artist card I painted of Pogo and sold on Ebay. I asked Mark to take some picture of me to send to my Mom in Minnesota. Pogo has a funny 'What are we doing?' expression here as she tries to wiggle out and jump down. 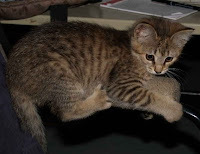 This morning she was a little ball of energy attacking anything with ears or a tail. Mouse finally asked for solace outside and then Puck got hit by the Kitten Cannonball. This tree frog with a white stripe was visiting one of our outside windows last night. 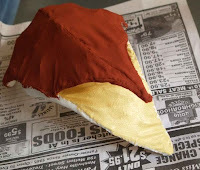 I still have some painting to do on the mask - then to try out my idea for the disks on the side. We leave for the Dayton trip next Wednesday, so there is a lot to prepare! 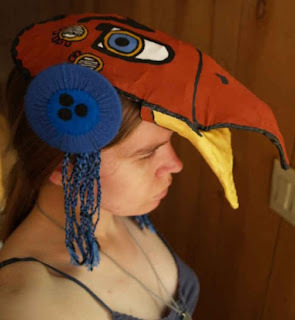 I say I get a lot out of my dreams, and my art ... this bird mask is an extension of a project that takes elements from both. 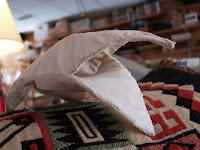 First I finished the sewing of the fabric to the wireframe. Then I sat down and planned out what the decorations and symbols should be. I didn't intend for it to look like Spiderman... but while putting the background into the picture I realized it kind of does! *eep* Well, those are the colors this should be, so if it shares them with Spiderman it does hehe. 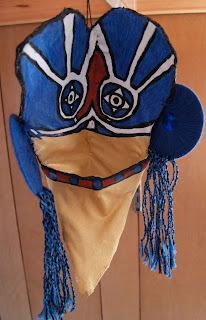 Interpreting the Art: This is meant to be a dream or spirit mask. It is covered in 'good' symbols from my artwork. A bird is a common symbol of a giver or deliverer of messages. The symbols inside and out on this mask 'talk' about seeing the path, and protecting life. The deep rust-red colour is a tie to the earth. I'll be continuing this project later - it will take some careful pencil drawing and painting to get it to look like the plan. I'm not sure what to put for the 'life' disks that are hanging like 'ears' either -- will have to think up what materials will work best for that. Found this for a good price on Ebay! If you didn't notice in the other two pictures, there was a Pogo sleeping in the bottom of the magazine table! I noticed after taking the first picture and disturbed her slumber to get this sleepy-eyed kitten picture. 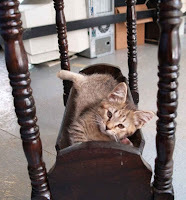 Chris really was right about cats finding the strangest places comfortable to sleep. Pogo sleeping here, however, reminds me of a baby in a cradle. There's even a pair of my socks underneath her for padding (which might be why she chose to sleep here - she loves to sleep on our clothes, wherever she can find them).